Now that summer has, we hoped, arrived (one never knows in north Idaho), I'm rushing to get the garden in. I've finished our strawberry beds and planted 200 bare-root strawberries. Next will be raspberries and blueberries. Vegetables. Hopefully boxes for new fruit trees. Etc. I have a black thumb, so gardening is a struggle for me. In my humble opinion, it's much easier to raise livestock. But regardless, if we're pushing to make this farm as self-sufficient as possible, clearly gardening must be high on our list of priorities. This "push" is becoming stronger. I don't like what I'm reading in the news. Maybe it's because we've been self-employed for the last 18 years, but because our financial foundation has always been precarious, we've learned to value independence and self-sufficiency. A job can disappear. So can our wholesale customers. Nothing is steady; everything is subject to shifts and changes. So we've learned to hang on with the tenacity of barnacles (which produce the strongest glue in nature -- betcha didn't know that!) when it comes to clinging to our rural life and our dreams of producing most or all of what we eat, ourselves. But it's not just food that concerns us, it's finances. When we first moved to Idaho eight years ago, we searched exhaustively for a piece of land and a house which met our criteria. Eventually we narrowed the choices down to two possibilities: our current home, and a gorgeous place on thirty acres with a year-round creek. But the other location was $80,000 more expensive. At the time our business was doing well and we could have afforded the other place. But we knew finances were shiftable things and we didn't want to put ourselves in a position of being enslaved to a mortgage higher than we could comfortably afford. That financial caution has served us well as the economy has tanked. I am astounded -- truly astounded -- that our home woodcraft business still has customers. Because I keep expecting those customers to disappear, it has made us doubly cautious with our spending. If we're going to spend money, we will spend it on something we feel will push us toward greater self-sufficiency. Like a Jersey heifer. Like 200 bareroot strawberry plants. Like a hay barn. Like other things we have bought or plan to buy. We are not the only ones expressing concerns about the economy. Finally, at last, the mainstream media is beginning to admit it as well. CNBC reports that "an increasing number, some 61 percent [of people polled], say they don't expect to return to their respective pre-recession lifestyles until the spring of 2014, if ever." It's the "if ever" I find eerie. Wayne Allyn Root had a sobering essay called Why the Greatest Depression of All Time Has Begun. (I quoted him in my latest WND column.) In it he says (about the economic downturn), "Here's where the story gets downright frightening. This time the results are going to be dramatically worse than 1929. This time we are facing The Greatest Depression ever. Why? Because The Great Depression had NONE of problems and obligations we are now facing. • In 1929 America was not $100 trillion in debt and unfunded liabilities. • In 1929, most of our states were not bankrupt, insolvent and dependent on the federal government to survive. • In 1929, we had far fewer government employees living off taxpayers. • In 1929, Social Security, Medicare, and Medicaid didn’t exist. The federal government had no such obligations threatening to consume the entire federal budget within a few years. • In 1929, there was no such thing as welfare, food stamps, aid to dependent children, or English as a second language programs. • In 1929, we had 150 million citizens with a strong work ethic. • In 1929, we had an education system that was the envy of the world. • In 1929 children had hope for the future. Today they are hopeless, helpless, and clueless – an entire generation that only knows drugs, gangs, rappers, government handouts, teen pregnancy- and it goes downhill from there. • In 1929 taxes were much lower. In other words, a future economic depression will be infinitely worse than the 1930's Depression because people lack a work ethic, a moral base, and the sense of independence of our great-grandparents; and because our own government has sold us down the river into economic slavery. Real cheery, yes? 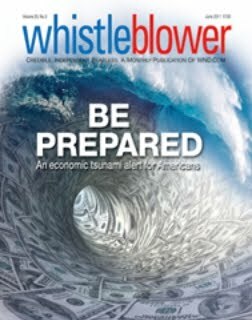 This month's issue of the magazine Whistleblower (WND's monthly publication) highlights preparedness. I was asked to be a sort of editor-at-large for this issue. This meant suggesting topics as well as providing a few of my own articles. To its eternal credit, WND has never shied from the subject of preparedness, nor scoffed at those involved in the movement. Seeking people for one-hour Reality TV special dealing with people who overstock food. Among the subjects we are looking for: people who stockpile food, who have more food in the pantry/fridge/freezer than they will ever use, people who cannot resist a deal at the grocery even if they do not need more items nor have room for them, and the like. By these criteria, we fit the bill in spades. Let's face it, we all know to whom this query is directed. It's directed at those kooky Preppers, the ones who (cough) "hoard" food. Ha ha, isn't that funny, look at all the tin-hat wearers who overstock food! What a bunch of dingbats! They even deserve their own reality show! That's the scary part. A crash is coming, and the various media outlets, the government, and the talking heads are ignoring it... or worse (but more likely) lying about it. It can no longer be avoided. Even the supposed "tough-love" fixes being floated by the republican leadership will do nothing to stop it. So we'll keep hearing about "the danger of a double-dip recession" or that our current troubles are just a "speed bump." And we'll continue to hear made-up unemployment numbers and watch the stock market bubble on a diet of imaginary money from the Federal Reserve. Meanwhile, we'll continue to push toward self-sufficiency and ignore the barbs of those who want to put us in reality TV shows. Everything is fine citezen move along. We all know that is nonsence, My brother just declared bankruptcy. Not cause he is smart. He is just the start of the debt spiral. The sheep declare bankruptsy what happens? Patrice, I hear ya! I was a little confused when my fella came home from a trip to Costco the other day with a massive amount of non-perishables. Rice, beans, etc. In response to my "Why the heck?" query, he told me he is very concerned that the dollar may be devalued within the very near future. As in, before the the end of 2011.We have food storage, but he felt it was important to get us a bit *over the top*, just to be on the safe side. As for the reality tv show...NO WAY would I sign up for that! First, they want to ridicule us, THEN--when the bottom drops out, everyone out there will know who you are, where you are and what you have! Good post and sadly, so true. With each generation we get farther from the 'self-reliance' generation of our g-grandparents that lived thru the 30's. If I would talk prepping to my great neices, they would call the men in the white coats. In 1929, more folks lived in rural areas also. There were also a majority who knew how or grew at least part of their food, even in the subburbs/smaller cities. People freak if they can't get cell phone reception these days and their work grinds to a halt...back then a vast majority of people didn't even have a phone! We are indeed a different nation than the one that handled the Great Depression 90 years ago. "One-hour Reality TV special," eh? The problem with these "reality" TV shows is they are anything BUT reality! Everything about them is contrived and manipulated. This one has just one goal: To show what silly worriers we "preppers" are. More food in the pantry than we will ever use? Who says so? When grocery stores are barren and food is nowhere to be had, then no one will ever have enough! But it's quite obvious the progressives of the world don't want us to be dependent on ourselves. To be ready for any disaster that might come along. No, they want us to be wholly dependent on Big Brother and when Big Brother has nothing to provide, then we'll turn to barbarism out of desperation. That will lead to many deaths, and many deaths is what they ultimately want. After all, there are far too many people on the earth, right? Just ask any liberal progressive, they'll tell you! I can't help thinking: If liberal progressives are so concerned about over-population, why don't they commit mass suicide to help save the planet? That would certainly cut a huge chunk out of our over-populated world. But our progressive leaders would never do that. They are huge hypocrites beyond belief, unceasingly spouting off about saving energy, while their homes (Al Gore comes to mind) use DOZENS of times more energy than an average home! They unnecessarily fly jets all over the world (at taxpayer expense), then lecture us about our "carbon footprints." How do they ever expect us to take them seriously? Fact is, we don't. And more and more of us are waking up to their hypocrisy and lies every day, thank God. This perception of preppers as hoarders makes me CRAZY. "people who stockpile food, who have more food in the pantry/fridge/freezer than they will ever use, people who cannot resist a deal at the grocery even if they do not need more items nor have room for them, and the like." Sadly, I know a man who fits the last phrase - he confessed to me he bought a ton of dog food because it was on sale at such a good price...even though he didn't have a dog. But what's even sadder is that the people looking for fodder for this "reality show" don't know the difference between preparation and pathological hoarding. I'm afraid they are the ones poised to experience a true "reality" shift. BTW...I told my friend to donate the dog food to the local animal shelter. I was pleased to see him so HAPPY to hear my suggestion (and my comment he'd probably be a hero), but also concerned he wasn't able to think of that possibility himself. "Reality TV"? Hah! Now there's an oxymoron. "More food than they will ever use"? Makes me wonder how long some people think "ever" is. Could they possibly mean 75 years? Even bugs and rodents store food away every year for when food is naturally scarce. Maybe in Consumer Driven TV Land food just magically appears on a store shelf. And if you have money enough you get to eat. Maybe somebody should clue them in. Because the sun shines just as bright on a poor man's garden and grass as it does on a mega farm's mono culture. Good luck with your garden efforts and your family's commitment to food independence. the truth is that whatever "reality" show acutally shows preppers will only get the real nut cases on. This is because no normal prepper would go on a show like that. It would be equivalent to putting a nice big target on your back saying "Hey everyone in case of emergency come to my place, I've got pleantly of food!" So the only people who will go on the show will be those that make the preparedness movement look bad. It'll be just like that "Extreme Couponing" show. Some of those people are ordinary and have good, solid plans for their stock, then you have the others who have no logic to their stockpiling, they buy stuff because they have coupons for it, and will discover some day that those 1.000 bottles of soda and 12.000 sticks of deodorant won't feed them OR their children. Some manufacturers are taking steps to prevent people from "purchasing" items with coupons (combining coupons to get something for free) by printing on the coupon that it can't be doubled, tripled or used with any other coupon which is normal, if the coupon is for one item, but it was a buy one get one. The manufacturer will not allow a coupon to be used on the buy one, then use their coupon for the get one free. I fear for those people who are so obvious in their stockpiling. They will be the first victim in their neighborhood. It's not going to be solely an economic collapse. It's going to be the end of western civilization. This is not an accident or a coincidence, it has all been planned and our gooberment is in on it. Not only should you not be part of the "reality show about preppers" (setup to be sure), but even watching it could be detrimental to your OpSec. Digital phones can be traced, can digital TV also be traced? IOW, can Big Brother determine who's watching what at any given time? That's another thing they didn't have in 1929: Reality television. Hearing the gut-wrenching stories of the government coming in and killing peoples' cattle and/or destroying their crops in the early '30s in order to comply with government economic policies while people were going hungry, should be mandatory for anyone who doubts the veracity of our concerns. Knowing how folks' homes were entered and searched if they were suspected of 'food hoarding' and how any food that exceeded the rationing laws was seized and taken away, should silence the mindless mockery of those who ridicule and taunt those who work to prepare. Both examples speak for themselves about the wisdom of 'preppers' becoming involved in any way with reality tv. Unfortunately, as has already been pointed out, it's the mentally challenged folks who truly do hoard and have compulsions who will be sought after and held up for exhibition and ridicule. And because the producers wouldn't know or care about the difference in true preparation and hoarding, we'd all be painted with the same broad, slimy brush. And congratulations, madame editor! WND obviously knows good talent when they see it. Well, I'm an optimist. I don't think it is going to be nearly as bad as it is being made out to be. The gloom and doom people love to spread rumors too you know. That doesn't mean that I don't have any food storage though, lol, or that I am going to stop trying to learn to be as self sufficient as possible. However, so far, in our community, we haven't seen any real change. The only difference so far is that if you have a job, you should probably keep it because they are few and far between now. Excellent post, Patrice. I'm linking it to my Facebook page, and emailing the URL to others. I read a news item today that Iran is just two months away from having working nukes. I suggested a pool to see who gets nuked first: Will they hit is with a high-altitude nuke to fry our electronics and blast us back to the 19th century, or will they not be able to resist the temptation to thow the first one at Israel? Either way, things are going to get really tough really soon. One question: I have never gotten around to subscribing to "Whistleblower." Do they provide a means for getting single copies? I was surprised to see that the homeschool convention in our state is having a workshop on preparedness this year. Never seen it before. The emphasis is on storing enough supplies to care for your loved ones and be able to be charitable in "troubling times." This post is rather sobering, I have to say. We are fairly self-sufficient now, but are way behind in the area of financial freedom. I agree, raising animals is a lot easier than raising crops. I think experience will make it easier, but the truth is, growing plants is hard, because the weather affects so much, and those conditions are not controllable like they are where animals are concerned.